Considering the importance of a roof and everything underneath, this structure tends to be the most neglected of any part of a building; yet without it, there is nothing else to protect the interior of a building interior. When it is time for an inspection or repairs are needed, it is very easy to downplay the need to get such work done personally or to even call on a qualified College Station roofer to detect problems and handle them. Following are some common errors made when it comes to the care and protection of this very important asset. The most frequent mistake made regarding roofing in general is the failure to have a roof regularly inspected. At the very least, performing a monthly inspection should happen, though many times even that is not given a priority. If an examination cannot be done by the building owner, someone needs to do it at least once a year. Naturally, the trained eye of a College Station roofer is better than an untrained one; however, an interested and informed building owner can learn what to look for and how to interpret what is seen, at least to a certain extent. 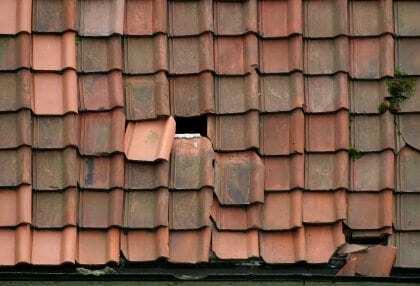 As a minimum, get up high enough to view the roof closely or use binoculars to get an idea of whether there are any cracking, bubbling, or otherwise damaged shingles that need attention. A very common repair mistake is waiting too long to have work done. Cost always seems to enter into a repair decision, especially if there is no leak or the problem is just a few missing or broken shingles – and yet this is the exact time to get repairs done before damage and cost increase. When deterioration has led to leaks, there is more costly damage to fix, more work and material to be used, and perhaps damage has extended under the decking and into the attic space. Don’t forget that getting a good contractor on an emergency basis can be difficult depending on the area and the time of year; and undoubtedly much more expensive. Hiring the wrong contractor for a roofing job is yet another common mistake when roof repairs are needed. Unfortunately, some contractors – especially those desperately looking for work – may say they can handle any roof; always be sure a contractor has experience with the type of material and installation that must be done. Repairs can be difficult; a contractor must know how to properly trace a leak to its source. Regardless of the damage, all roofing material is not created equal; a contractor who normally works on asphalt shingles will not automatically be able to repair metal roofs or ceramic tile. This information should be verified ahead of time as allowing the wrong person to do the work can just create an even bigger – and costly – problem. Once hired, the rest of the roofing repair process is up to the contractor. When the right one has been hired, there is a feeling of confidence that whatever work must be done, it will be correctly handled. Pay close attention to repairs with flashing, individual shingle replacement, and small leaks as these are not really a quick fix job and may involve more detail work, perhaps more than when the roof was initially installed. By avoiding such main roofing repair mistakes, building owners will have done everything possible to keep a structure in good condition. Proper inspection, timely intervention, and the right contractor is all that is necessary to keep a roof looking and protecting for its proper lifetime! Turn to College Station Roofing To Be Your College Station Roofer! Do you need to find a College Station roofer? Call College Station Roofing at 979-217-2395 to find experts ready to help handle any of your roofing needs!